There are two types of backpack sprayers currently in the market. We have the manual kind that requires pumping and the automatic kind that is battery operated. Of course, there is a wide range of these backpack sprayers ranging in different design and style. However, when shopping, the key features that you need to check out include the capacity, design, and cost of the backpack sprayer. In our buyer’s guide, we have evaluated the top 15 best backpack sprayers for the year 2019. Sure, we have narrowed down the full range of options to enable you to get the best model. Skip to the best Backpack Sprayer on Amazon. This 1.3-gallon backpack sprayer is a good choice for new as well as seasoned users. It’s suitable for both the indoors and outdoors and is compatible with most pesticides, insecticides, liquid fertilizers, herbicides and more. It comes with the transparent body for easy view of the content and an easy-fill funnel top opening. The wand measures approximately 16 inches and is very flexible while the shoulder straps are adjustable. It also comes with a comfortable grip handle, a shutoff valve, and easy open/close lid. The Rain Maker is one of those brands that are making waves in the industry when it comes to backpack sprayers. A good example is this unit which delivers very good pressure. Similar to other top brands, this unit is built to withstand day to day use and the solid construction can tolerate bangs, knocks and falls quite well. It comes with a decent capacity of 4-gallons and can be used with soluble fertilizer, pesticides, herbicides, insecticides and more. The four interchangeable nozzles are designed for varied applications while the integrated filter prevents blockage or contamination. For continuous spraying, there is a built-in trigger that can also be locked. 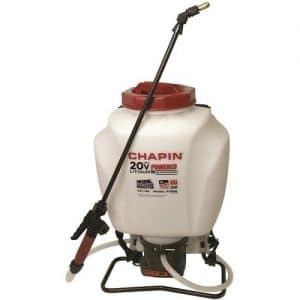 When it comes to backpack sprayers, the Chapin brand is without doubt “King.” One of their most acclaimed products is the 63985 4-gallon sprayer that can handle a range of chemicals including weed killers (herbicides), insecticides, and pesticides. The unit is powered by a 20-volt Lithium-ion battery that saves the user from having to manually pump the accessory. It delivers up to 40 psi of pressure and this covers a maximum length of 35 feet. For easy filling and cleaning, it features a 6-inch wide mouth funnel whereas the three nozzles are suitable for different applications. The straps are padded at the shoulders for better comfort and it also comes with cushion grip shut off. Starting in our list of top best backpack sprayers is HD Hudson Multi-Purpose Professional Back-Pak Sprayer. This sprayer is designed with an improved technology making it preferable by many customers. The tank of this best product is translucent; therefore it allows you to quickly and view the liquid level inside. The gallon poly tank is convenient in holding 4 gallons of liquid. Additionally, it is equipped with Viton seals. This best backpack spray features 70PSI sealed diaphragm style pump. In the same way, when you purchase this spray, you will receive three plastic flat fan nozzles. It also has 47” industrial spray hose and a solid steel pump handle. Of course, the handle of this product is designed to have a good grip. Another thing is the locking shut off valve with in-line filter featured in this sprayer. This ensures that the sprayer operates effectively without permanent damages. Surprisingly, this product is designed from high-quality materials therefore durable to last many years to come. Again, it features a one-year warranty duration against any defects. To conclude, the sprayer measures 24.2 by 9.8 by 16.2 inches. Next on the list is yet again a professional sprayer designed with your needs in mind. This product features top grade materials which are durable and reliable. Nevertheless, it is equipped with four nozzle assortments for a wide range of spraying task. That is, it has a hollow cone nozzle, fan spray nozzle, adjustable nozzle, and jet stream nozzle. 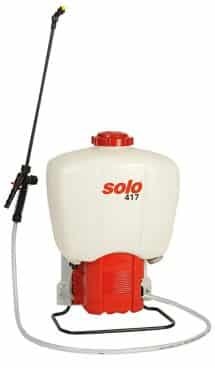 This is the best sprayer in the market that effectively handles fertilizers, herbicides, and disinfectants. Similarly, it is made with high-performance piston pump to enable it to pump liquid at an increased pressure of up to 90psi. It also has a commercial shut-off valve with a lock on/off the design to minimize user fatigue of the sprayer. The Viton seals which are located in the critical positions of the sprayer guarantee long service and durability. Another exciting thing about this product is that it features a simple design making it easy to operate. It is equipped with an interchangeable handle that is convenient for left or writes operation. Likewise, it has a 48” nylon reinforced high-pressure hose for extended reach. This product is one of the best models currently boasting of good quality design. This is a powerful sprayer that operates quietly. It features a unique design making it the top best choice for many customers. Equally, the unique design of this product makes it easy to operate and use. I mean, it whispers with no emissions. The sprayer is crafted with a 60 inches nylon-reinforced hose that provides extended reach and increased durability. Most importantly, this product comes with a 100% satisfaction guarantee. If you purchase it and find out that it does not meet your needs, then you can return it and get a refund for another one. This US gallon is designed to hold up to 18 liters of liquid. It features a transparent tank that is made from durable and robust UV resistant high-density polyethylene. Also, the sprayer is made with a 2-step toggle switch that is low 36psi and high 62 psi. Unlike similar models in the market, this is a battery powered backpack sprayer. It takes less than 3 hours for this sprayer to charge fully. Finally, if you are out there shopping, then this is a suitable product that you should consider trying out. Scooping the 9th position in the list is a sprayer with a plastic wand and adjustable steel wand. This is a new and improved model of sprayer that is boasting of excellence in the market. It features a translucent tank that makes it easy for you to see the liquid level inside. Unlike other models in the market, this particular sprayer has a battery door and HD Shoulder Straps. This is the highest rated sprayer in Amazon. Of course, this is a fact that the sprayer is beyond many other models when it comes to performance and quality. It provides the most powerful control and reliability. Furthermore, this product is the ultimate choice for many professionals. Backpack Sprayer is designed with adjustable pressure variable nozzle output making it excellent in its operation. Additionally, it requires 8 AH lead acid battery for it to perform. Again, this top best sprayer comes with different type of nozzle attachment ready to use in a few minutes. The sprayer works pretty well with most of the chemicals that are roundup, Thomson water seal and Mark it Blue. This sprayer is designed with wand retainer for easy carrying and storage. It also has a wheeled caddy which is useful in handling a harsh terrain and stability with the tank upright. This is the best product in class quality. For instance, it is built with a chemically resistant and durable umbrella valve preventing the formula from entering the cylinder. Additionally, the sprayer has Viton seals located in key areas to protect useful components from chemicals. It has a unique storage compartment that is ideal for keeping nozzles in order. Again, this allows you to quickly choose a favorable nozzle for a spray type based on application. Moreover, it has a large funnel top making it easy to fill up and large secondary opening for easy cleaning. The sprayer is made with a heavy-duty handle for pumping and a built-in retainer for easy storage. This is a unique sprayer featuring a commercial quality interchangeable nozzle. Similarly, the durable 20-inch wand in this sprayer is convenient and ensures a long lasting life. Furthermore, this sprayer has a commercial shut-off valve with a lock on/off feature to reduce operator fatigue. 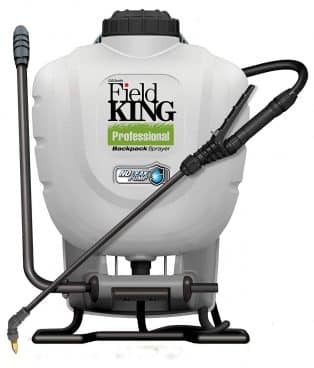 At position seven in the list a great sprayer by Field King. This product is designed with an internal pump which does the work of a piston and keeps your back dry. The pressure produced by this product reaches up to 150psi which sprays to a range of 30 feet. Of course, this sprayer has a built-in agitator that enables it to handle powder, liquids, and water-soluble solutions. Another thing, it features Viton seals land gaskets which are ideal for maximum chemical resistance. However, it is suitable for fertilizers, herbicides, insecticides, and weed killers. Unlike similar sprayers in the market, this product has minimal high-wear parts. It can be repaired in a few minutes without the use of any tools. In the same way, the premium shut-off design of this product offers a comfort grip. It also has a lockable trigger to prevent hand fatigue. The removable in-line filter of this product is beneficial in reducing clogging. Sure, the large opening of the filtration basket of this sprayer traps large debris out of the tank while filling. Also, it is made with a secure handle with no slack no jiggling. Finally, this product has an adjustable chest clip and lumbar support to ensure that it stays in place. Halfway in the list is a wonderful 4-Gallon sprayer backpack. This product features a contemporary design making it elegant and beautiful. Backpack Sprayer is made from high-quality materials which are durable and reliable to last for an extended period. Equally, it has a wide mouth opening that makes it easy to fill in a few minutes. Another amazing thing with this product is that it has a translucent tank for the clear view if the level of liquid inside. Sure, it is compatible with plenty of common fertilizers and pesticides. This is a unique sprayer with 3 stage filtration system and a removable in-tank making it easy to clean. Moreover, it has poly shut-off with three nozzles which are a fan, cone, and adjustable brass. 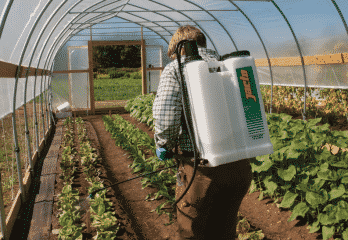 Unlike a wide range of products in the market, this model of the sprayer is designed with padded shoulder straps. Of course, they are instrumental in accommodating a full backpack for an extended duration. Finally, this sprayer measures 14.8 by 8.5 by 22.1 inches and weighs 9.2 pounds. Taking the 5th position is a sprayer with a 4-inch mouth opening for easy filling and cleaning. It is also equipped with a strainer basket which is useful in trapping debris when filling the sprayer. The adjustable spray tip allows you to adjust from a fine mist to a focused stream making the sprayer perfect for any application. Likewise, it has a comfortable strap and back pad to accommodate the sprayer on your back for a long duration. Sure, it is ergonomic in design and easy to use. It works pretty well with pesticides in hard to reach places. Lastly, the translucent tank enables you to keep track of the liquid levels as you spray. 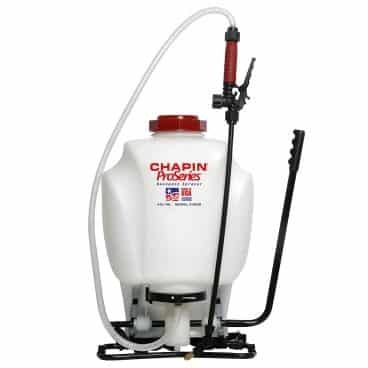 This is a unique yet lovely sprayer by Chapin International. The 4-Gallon translucent tank features a wide mouth opening for easy and fast filling and cleaning. Of course, the sprayer is compatible with common fertilizers and pesticides. For instance, it features 3-stage filtration systems with a removable in-tank. Additionally, this great product has three nozzles for a wide variety of applications. Lastly, the padded shoulder straps of this product make it convenient to accommodate a full backpack for extended hours. Taking the 3rd position is a product that easily and effectively handles fertilizers, pesticides, and herbicides. It features a piston pump which produces a pressure of up to 90 psi. Of course, this enables the user to perform virtually every spraying task. The padded straps of this sprayer are convenient for added comfort and preventing fatigue. What makes this backpack sprayer among the top best models in our list is the internal paddles design. It features a built-in agitator that is convenient in handling liquids, powder, and water-soluble solutions. This is a unique sprayer that can be repaired in a few minutes without the use of any tools. In the same way, the internal pressure chamber of this product allows a maximum pressure to reach 150 psi. The internal components of this product are made of high-quality brass material which is durable and reliable. Additionally, it has a four nozzle system for a wide range of spraying activity. Scooping the 1st position in the list is an improved sprayer with easy to open sprayer cap. The mouth opening of this sprayer measures 4-inch therefore easy to fill and clean. Moreover, it has a unique removable in-tank filter which also makes it easy to maintain and clean. The sprayer features an ergonomic design with shut-off and three nozzles for a variety of applications. Nevertheless, the comfortable straps and padded shoulder allows an extended period of holding the sprayer on your back without fatigue. These are the top rated and reliable backpacks sprayers you will find in the market. The products have been designed using the best quality materials and will provide long-term service. Sure, these are the best picks that you don’t want to miss. The Roundup brand is world-famous for its herbicide that goes by the same company name. They have gone a step further to offer you a back sprayer that will help you spray the Roundup herbicides as well as other types. This sprayer comes with an internal pump that ensures no leakage or contamination of the chemicals. This is boosted by the 21-inch poly wand and the chemical-resistant Viton seals. Its simple design makes changing seals pretty easy and doesn’t require special tools whereas the 3-inch wide mouth makes adding chemicals simpler. The item features an in-line filter, lockable shutoff, and 4 different nozzles. 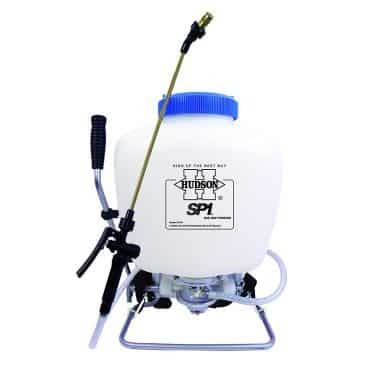 Individuals, as well as professionals looking for a good backpack sprayer, should think of the 190426 backpack sprayer. Coming from Roundup, this unit should serve you well in your garden, lawn, or farm. It features a heavy-duty poly tank that can accommodate up to 4 gallons of insecticides, herbicides, pesticides or liquid fertilizer. The poly wand is also heavy-duty and comes with a comfortable grip and shutoff. For added resistance against chemical corrosion, the sprayer comes with nickel-plated poppet and Viton gaskets & seals. The inline filter prevents dirt and contaminants from messing the mechanism while the 4 nozzles improve versatility. For added support and comfort, the unit features padded straps and built-in lumbar support. Backpack sprayers have not only made life easier but also more convenient. 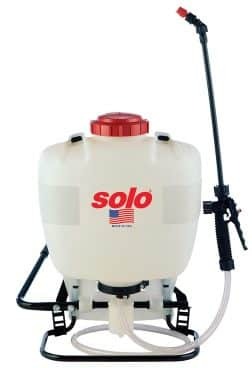 You no longer have to make countless trips while spraying herbicides on your garden or farms to get rid of weeds, or use small handheld devices to spray pesticides on your crops, or spend lots of effort applying insecticides in and around your property. They come in different shapes, designs, sizes, and mechanisms to suit the varied needs. Also, you can choose a motorized one that requires minimal effort and is much faster than a manual type. However, you need to be prepared to spend more for the motorized unit. Different types are readily available in the market and not every type is ideal for your need at hand. 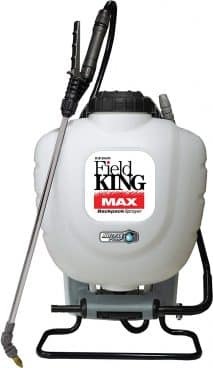 To help you make the right decision, we have reviewed the top 10 best backpack sprayers reviews in 2019. This battery-powered backpack sprayer is ideal for use around the home, office as well as in the garden or farm. It’s designed to work with a range of chemicals including herbicides, pesticides, insecticides, fungicides and much more. The item features a translucent 4-gallon tank and a handy and easy to maneuver wand. Thanks to being battery powered, you don’t have to keep pumping the accessory. The rechargeable battery will last for up to 6 hours and will offer decent pressure even when almost drained. 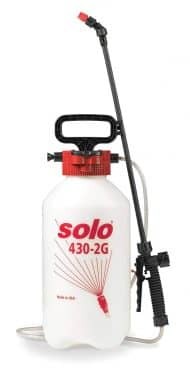 Eliminating weeds, grass, unwanted plants, insects, bugs and other nuisances from your garden, lawn, farm and other places is easier with the Solo 425 backpack sprayer. 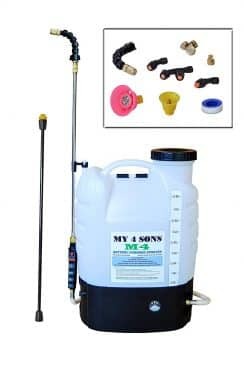 The professionally-designed accessory has a 4-gallon capacity and is designed for a range of chemicals including herbicides, weed killers, pesticides, insecticides and also soluble fertilizer. It comes with a strong piston that will generate pressure as high as 90 psi and a sturdy 48-inch nylon-reinforced hose. This makes it effective for large areas and also reduces the effort used for pumping. To minimize fatigue, the unit comes with a lock-on/off feature whereas the Viton seals prevent leaks and spills. The pump handle can easily be interchanged to serve both right and left-handed users. Getting rid of weeds, insecticides, pests and other nuisances from the home, garden, farm or lawn shouldn’t be a problem. 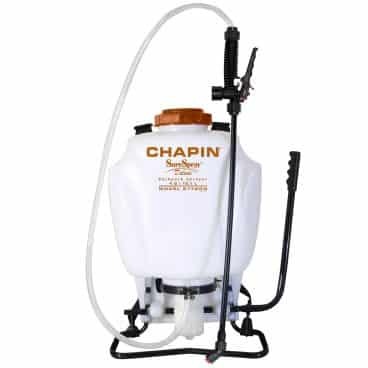 With the Chapin 61500 4-gallon backpack sprayer, you will effortlessly and conveniently spray herbicides, pesticides, and insecticides to the target region. The 4-gallon capacity can accommodate high volumes while the flexible wand and nozzle are easy to maneuver. The accessory comes with a convenient and friendly wide mouth opening, a translucent tank for easy viewing, and 2-Stage filtration system to prevent dirt, dust and other substances from messing with the mechanism. Also featured are a fan tip, adjustable poly cone, padded shoulder straps and 2-nozzle poly shut-off. 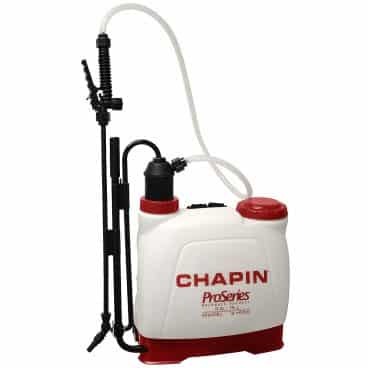 This backpack sprayer is famed for its internal pump design that minimizes the possibility of any leakage. 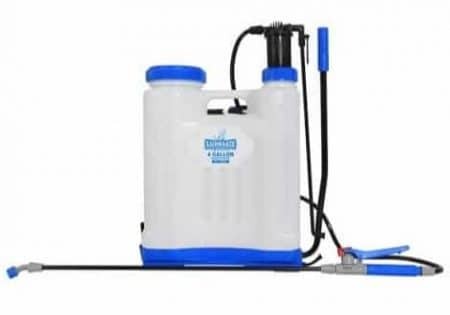 Like other top items, it also comes with a translucent tank for easy viewing and is suitable for spraying herbicides, insecticides and pesticides. The accessory features a well-made 21-inch poly wand that can easily be adjusted to suit the need at hand. The high-quality Viton seals prevent any leakage and are also resistant to the chemicals. Changing the seals is straightforward and doesn’t take long while the in-line filter and lockable shutoff prevent contamination or accidental spillage. The sprayer also comes with 4 types of nozzles (2 flat fans, brass adjustable and foaming) but is also compatible with TeeJet nozzles. With the Hudson 97154 SPI backpack sprayer, weeds, insects, bugs and other pests will no longer be a nuisance. The multi-purpose unit constitute a translucent poly tank that can accommodate up to 4 gallons, a sealed diagram pump that generates up to 70psi, and a 20-inch adjustable wand for directing the chemicals. The solid pump handle is made of steel and together with the Viton seals will ensure seamless operation without any leaks. Other features are 3 plastic fan nozzles, 47-inch spray hose, and locking shutoff valve that comes with an in-line filter. 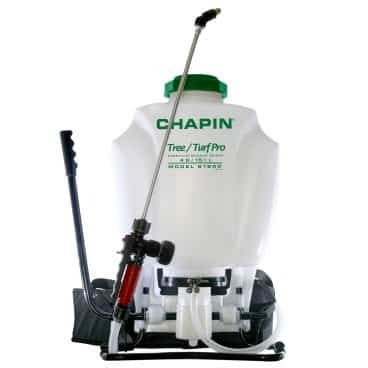 Featuring a 4-gallon tank and a stainless steel wand, this commercial backpack sprayer by Chapin International can tackle both small as well as large jobs. It features a translucent tank for easy viewing while the side markings allow you to know the remaining or measure the gallonage. The accessory comes in a heavy-duty design and is fit for heavy-duty applications as well. It can spray herbicides, pesticides, fungicides, soluble fertilizers and other chemicals around the home, office block, garden, lawn, field, and also in the farm. To prevent blockage, it relies on a 3-Stage Filtration system while the three nozzles enhance its versatility. Combining functionality, portability, and reliability is this 4-gallon backpack sprayer by My 4 Sons. The decent size and ergonomic design make carrying it on the back pretty easy and comfortable. It also comes with sturdy and comfy straps that firmly secure it on your back. The unit features a wide mouth that makes adding herbicides, pesticides, insecticides and other chemicals easy. It also has a powerful electric motor for delivering the pressure and a brass nozzle and steel wand for directing it where needed. 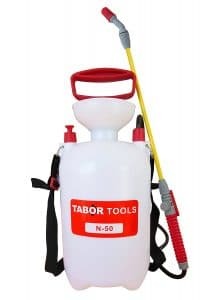 Featured above are the top 10 best backpack sprayers in 2019. They stood out from the rest because of quality construction, easy to use, firm base, good support, decent spraying range and are also easy to maintain. They also scored highly because of easy maintenance, comfort, good support, and are easy to clean. Nonetheless, we still managed to unveil the crème de la crème of them all. The top position went to My 4 Sons electrical sprayer. It’s the most comfortable, delivers the best pressure and longest range, and despite its powerful motor, the unit is very light and compact. We also loved its decent price and the good ergonomics as well. The only drawbacks are it is heavy when full and is also not the cheapest.